, one of the most celebrated Swiss divines of the latter age, was born at | Neufchatel, Nov. 25, 1663. He was the only son of John Rtfdolph Ostervald, minister of Neufchatel, Inhere the family of Ostervald had been settled for nearly three centuries, and had produced many persons eminent in the army and at the bar. His father determined to give him the best education, with a view to the ministry, should his inclination lead that way. Accordingly, in 1676, he took him to Zurich, to be instructed in the learned languages, and to learn German at the same time, under the care of professor John Henry Ott, who was his intimate friend. After a dilfgent application here for eighteen months, young Ostervald returned home in Oct. 1677, and continued his classical studies tinder Mr. D’Aubigne, principal of the college of Neufchatel. 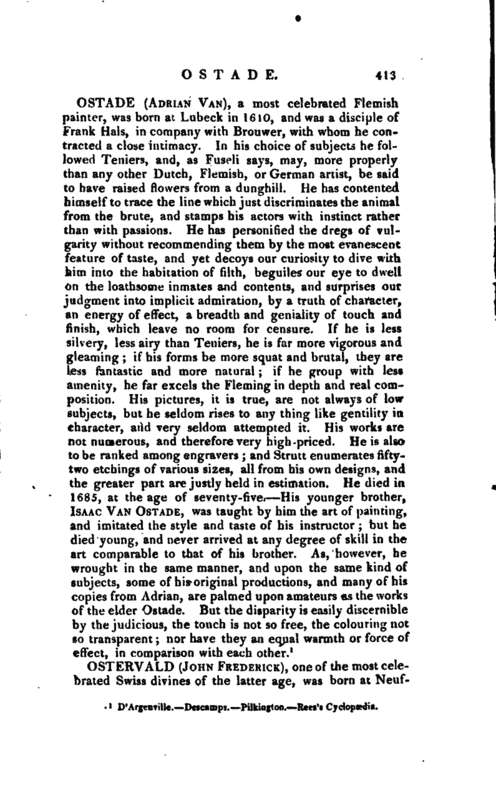 A year after he was sent to Saumur, where he maintained some learned theses with such ability, that the degree of master of arts was conferred upon him with every testimony of respect, although he had not yet reached his sixteenth year. In Sept. 1680, he took a voyage to Rochelle, where he was introduced to some eminent literary characters; and the following year, removed to Orleans, and began the study of divinity under the celebrated Pajou, which he continued afterwards under Mr. Allix, and the celebrated Claude, at Paris. 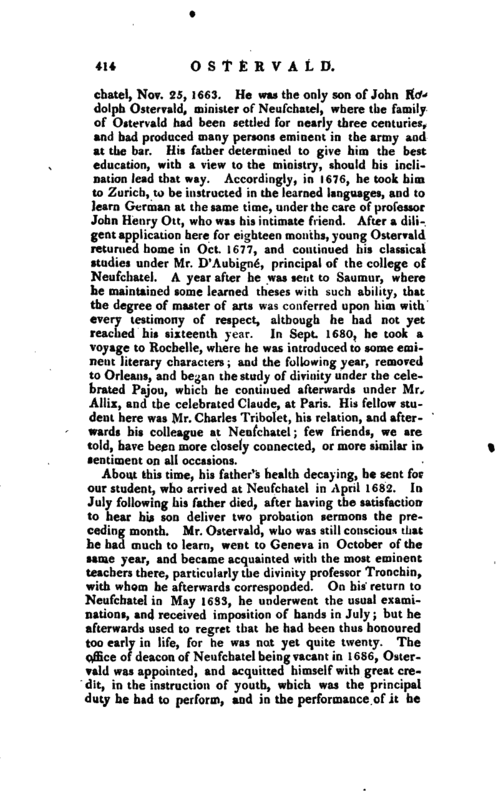 His fellow student here was Mr. Charles Tribolet, his relation, and afterwards his colleague at Neufchatel; few friends, we are told, have been more closely connected, or more similar in sentiment on all occasions. About this time, his father’s health decaying, he sent for our student, who arrived at Neufchatel in April 1682. In July following his father died, after having the satisfaction to hear his son deliver two probation sermons the preceding month. 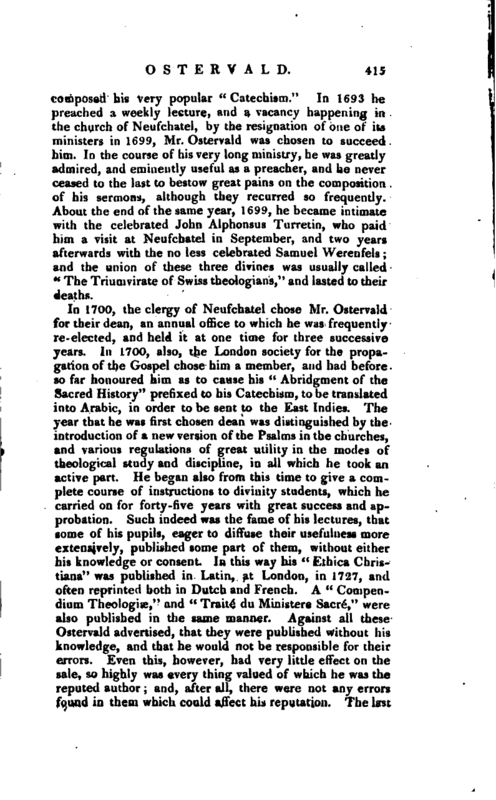 Mr. Ostervald, who was still conscious that he had much to learn, went to Geneva in October of the same year, and became acquainted with the most eminent teachers there, particularly the divinity professor Tronchin, with whom he afterwards corresponded. On his return to Neufchatel in May 1683, he underwent the usual examinations, and received imposition of hands in July; but he afterwards used to regret that he had been thus honoured too early in life, for he was not yet quite twenty. The office of deacon of Neufchatel being vacant in 1686, Ostervald was appointed, and acquitted himself with great credit, in the instruction of youth, which was the principal duty he had to perform, and in the performance of it he | composed his vety popular “Catechism.” In 1693 he preached a weekly lecture, and a vacancy happening in the church of Neufchatel, by the resignation of one of its ministers in 1699, Mr. Ostervald was chosen to succeed him. In the course of his very long ministry, he was greatly admired, and eminently useful as a preacher, and he never ceased to the last to bestow great pains on the composition of his sermons, although thqy recurred so frequently. About the end of the same year, 1699, he became intimate with the celebrated John Alphonsus Turretin, who paid him a visit at Neufchatel in September, and two years afterwards with the no less celebrated Samuel Werenfels; and the union of these three divines was usually called “The Triumvirate of Swiss theologians,” and lasted to their deaths. Mr. Ostervald had a considerable hand in the new liturgy which was introduced in the beginning of the last century in the churches of Neufchatel and Vallagin, btit this was not printed until 1713, soon after which an English translation appeared. Before tbis, in 1699, his first avowed publication appeared, under the title of “Traite des Sources de la Corruption,” which was also translated into English, and is one of the “Tracts” published by Dr. Watson, the present bishop of Llandaff, in 1782. The principal opponent Ostervald met with was Philip Naude, the mathematical professor at Berlin, who objected that in a treatise on the sources of the corruptions that exist in the world, he had kept too much out of sight that great source, the fall of man. 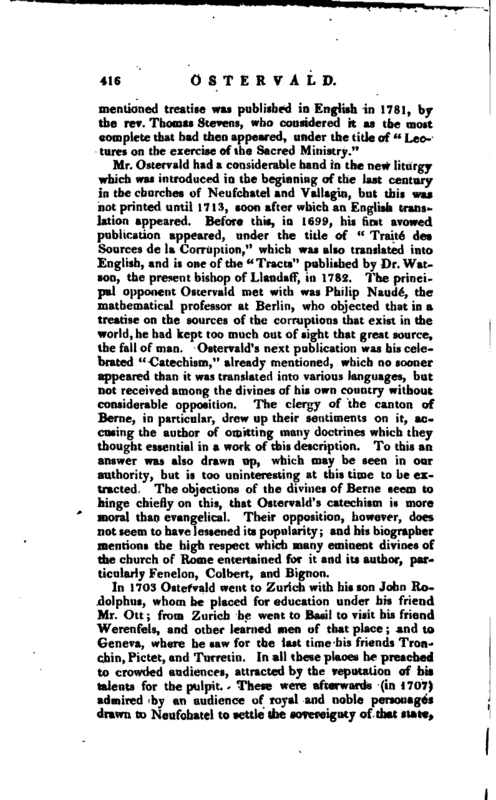 Ostervald’s next publication was his celebrated “Catechism,” already mentioned, which no sooner appeared than it was translated into various languages, but not received among the divines of his own country without considerable opposition. The clergy of the canton of Berne, in particular, drew up their sentiments on it, accusing the author of omitting many doctrines which they thought essential in a work of this description. "To this an answer was also drawn up, which may be seen in our authority, but is too uninteresting at this time to be extracted. The objections of the divines of Berne seem to hinge chiefly on tbis, that Ostervald’s catechism is more moral than evangelical. Their opposition, however, does not seem to have lessened its popularity; and his biographer mentions the high respect which many eminent divines of the church of Rome entertained for it and its author, particularly Fenelon, Colbert, and Bignon. In 1703 Ostervald went to Zurich with his son John Rodolphus, whom he placed for education under his friend Mr. Ott; from Zurich he went to Basil to visit his friend Werenfels, and other learned men of that place; and to Geneva, where he saw for the last time his friends Tronchin, Pictet, and Turretin. In all these places he preached to crowded audiences, attracted by the reputation of his talents for the pulpit. These were afterwards (in 1707) admired by an audience of royal and noble personages drawn to Neufcliatel to settle the sovereignty of that state, | in consequence of the death of the duchess de Nemours. The decision was in favour of the king of Prussia, before whom he preached with such eloquence on the duties of subjects to their sovereign, that his majesty requested his sermons might be printed; but this was declined on the part of Ostervald. This year, however, he published his “Traite contre PImpurite,” which was translated into English, under the title of “A Discourse against the sin of Uncleaiiness,” and went through many editions both in English, French, and German. 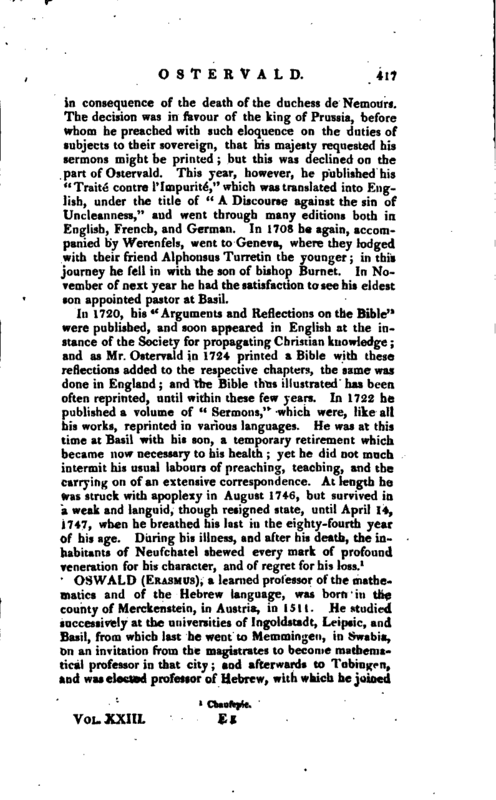 In 1708 he again, accompanied by Werenfels, went to Geneva, where they lodged with their friend Alphonsus Turretin the younger in this journey he fell in with the son of bishop Burnet. In November of next year he had the satisfaction to see his eldest son appointed pastor at Basil.